Yes! That is me - getting read to saw a board. The white stuff covering the outside wall is called Tyvek. The properties of Tyvek helps to combat water, moisture and air infiltration that are any building's worst enemies. Allowed to penetrate behind siding, wind-driven rain and moisture can saturate walls, creating a breeding ground for mold, mildew and wood rot. The properties of DuPont™ Tyvek® do not support the growth of mold or mildew. Air infiltrating from outside can create comfort-robbing cold or warm spots while increasing heating and cooling costs. The material is light, comes in a 11 foot wide roll and is very easy to install - but it take two people to install it. I have discovered the easiest process is for one person to roll out a section, and the second person to follow behind securing it on the external sheathing with a construction stapler. Doing an entire section or wall at a time works best. Starting from a corner, lay the roll vertical to the wall and stable from the top to the bottom every 12 inches or so. Then just roll it out to the next corner and secure it again at this break point. Outside corners are real easy - its the inside corners that are a bit tricky. In the corners we discovered that holding the roll into the corner while securing with the stapler worked well for the wall on the first side of the inside corner. We then rolled out another foot to make it around the inside corner and stapled again, but with he added step of using a hind to ensure the Tyvek was right in to the corner. We just continued right around the whole cottage until we met up with the starting point. 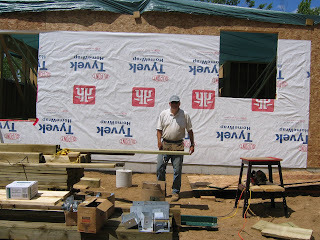 Then, I went back over the Tyvek putting in more stables to fully secure it tot he sheathing - about every 12 inches on the edge and every 2 feet everywhere else. NOTE: In the above picture we had actually ran out of material on the first roll, and had not started on the next.